This case report describes a geriatric, overweight Chihuahua with decreasing quality of life due to paraparesis of her hindlimbs and associated pain. Bloodwork and radiology results initially pointed to multiple myeloma, but eventually pointed towards arthritis and chronic intervertebral disc disease (IVDD) lesions. 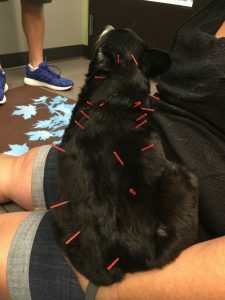 She responded well to acupuncture that targeted neuromodulation for her known IVDD lesions, arthritis, and trigger points found on physical exam. Laser therapy, weight loss, and ICHON injections were also utilized. Daisy is an 11-year-old, spayed female, Chihuahua mix that presented initially in February 2018 for right hind limb lameness. Daisy had a previous diagnosis of a right cranial cruciate injury. Due to continued clinical signs, Daisy was started on Galliprant and ICHON ( Generic Adequan) injections. Daisy continued to improve until July 2018 when her owner reported that Daisy seemed reluctant to walk. Her owner described generalized weakness and fatigue. Full body orthopedic radiographs were pursued and sent to a radiologist who remarked that the radiographs were very suspicious of Multiple Myeloma. During this time, ICHON injections were postponed and Galliprant (2 mg/kg) and Gabapentin (10 mg/kg) were given for pain management. Senior screen bloodwork was initially supportive of this diagnosis, but Bence Jones proteinuria and Protein Electrophoresis was negative. Consult was pursued with the oncology department at the University of Florida. Complete blood count, chemistry, and urine were found to be within normal limits. A full body CT was performed and osteoarthritis was found in Daisy’s left shoulder, both stifles, and both tarsal joints. Chronic intervertebral disc disease (IVDD) was also appreciated at C6-7 and T9-10. The “coarse trabecular pattern” noted by the radiologist in the tibias, femurs, and tarsus bilaterally is considered to be an incidental finding. The oncology department did not find any evidence of cancer and Daisy was discharged. On presentation after returning from her diagnostics at the University of Florida, Daisy was non-painful, but could not ambulate very well. Daisy’s owners reported that she could walk when helped up, but only for about 5 feet at a time. Most of the time at home, she propelled herself with her forelimbs and dragged her hind limbs across the floor. She was mostly stationary, not moving from her bed for many hours. On physical exam, Daisy had decreased cervical range of motion laterally and dorsally. Taught bands were appreciated in the omotransversarious muscles bilaterally. Trigger points were present in between the shoulder blades in the area of BL 13, BL 14, and BL 15. Daisy’s triceps muscles were very tight bilaterally. Trigger points were appreciated on the Bladder line over T9-L2. Daisy sit and complained when L5-L6 area was palpated as well. Daisy’s hamstring muscles were very weak and appeared to be almost flaccid on palpation. Delayed proprioception was appreciated in her hind limbs and Daisy also had a positive crossed extensor reflex on both hind limbs. Daisy had increased patellar reflexes in her hind limbs as well. Daisy’s main problems are pelvic limb weakness (paraparesis) and cervical pain which can both be explained by her top differentials of chronic intervertebral disc disease lesions (C6-C7 and T9-T10), Osteoarthritis, nerve compression from taut bands/trigger points, or neoplasia including Multiple Myeloma. Daisy’s working diagnosis is Chronic intervertebral disc disease (C6-C7 and T9-T10) causing paraparesis and compensatory trigger points in triceps and cervical region. Daisy’s IVDD lesions were appreciated on her full body CT performed at the University of Florida. Due to daisy’s clinical signs of hind limb paraparesis and decreased proprioception in her hind limbs, these lesions are thought to be the main cause of her problems. Osteoarthritis most likely plays a role in Daisy’s weakness as well. Multiple Myeloma or any kind of neoplasia was ruled out with bloodwork and imaging during Daisy’s visit to the Oncology department and the University of Florida. Daisy has good pain control on Galliprant for anti-inflammatory effects and Gabapentin for neuropathic pain relief. ICHON (generic Adequan) injections were added for their effect on promoting good collagen in joints. Acupuncture and laser therapy were recommended at once weekly intervals for pain relief, axon regrowth, and anti-inflammatory effects. This will especially be helpful at the level of the spinal cord for Daisy due to her chronic IVDD lesions and neurologic deficits. Distal points were selected on Daisy’s pelvic limbs to encourage nerves to talk to the spinal cord. In addition to these effects, releasing myofascial tension would also help to make her more comfortable, improve her mood, and encourage her to start moving around more. 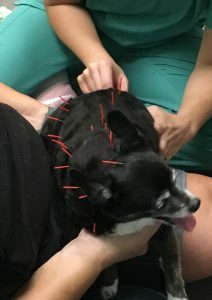 Prior to starting acupuncture treatments, Daisy was started on ICHON injections (0.17 ml intramuscularly) at twice weekly intervals for 1 month, once weekly for one month, and then once monthly or as needed. Daisy’s body condition score was 7/9 at 9 pounds. Weight loss treatment with Hill’s Metabolic Mobility canned was started as well. Laser therapy was started for Daisy as well. The laser used is a Class 4 Companion laser. Treatment was performed on her cervical and thoracic spine on the arthritis setting. Daisy’s cervical spine was treated at 3.5 W and 402.5 J. Her thoracic spine was treated at 5.0 W and 815 J. Laser treatment was also performed over Daisy’s stifles, hamstrings, and quadriceps bilaterally to encourage blood flow and decrease inflammation. The treatment was performed on the arthritis setting at 4.0 W and 808 J. Daisy received twice weekly laser treatments for 3 weeks before acupuncture was performed. Daisy’s owners saw some improvement in Daisy’s attitude at home with some increased barking and tail wagging. Daisy could stand through her laser treatments, but would not walk for more than a few steps without asking to sit down. Once weekly acupuncture treatments were started with dry needling. ICHON injections were continued throughout at her recommended intervals. Laser therapy was also continued during Daisy’s once weekly acupuncture treatments. For Daisy’s first treatment she received 15 mm long, 0.16 mm diameter SERIN needles. GV 20 was used as a calming point. GV 14 was used for neuromodulation of the cervicothoracic spinal cord and for its use to treat neck and back pain. GV 4 was placed for neuromodulation of the cranial lumbar spinal nerves and for its use to treat lumbar pain. Bai Hui was placed for neuromodulaiton of the mid to caudal lumbar spinal nerves and for its use to treat lumbosacral pain, pelvic limb pain and neurologic dysfunction. BL 13, BL 14, and BL 15 were placed bilaterally for neuromodulation of the cranial thoracic spinal nerves and to release trigger points palpated in this area. BL 17, BL 18, and BL 19 were placed bilaterally for neuromodulation of the midthoracic spinal nerves due to Daisy’s known lesion at T9-T10 and to release trigger points in this area as well. Daisy was anxious for her first treatment. Once the needles were removed from her back, GB 30 was placed for neuromodulation of the sciatic nerve and manual massage of Daisy’s Bafeng points was performed for stimulation of distal nerves. Laser therapy was performed on Daisy’s cervical area and thoracolumbar spine and over her quadriceps, hamstrings, and shoulders at the previously described doses. 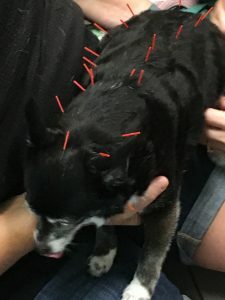 At Daisy’s second acupuncture appointment, her owners noted that she seemed happy after her last treatment and had gotten up to follow the owners across the house a few times which is not usual for her lately. Daisy had mild kyphosis in the L2 area at this appointment, but her hamstring muscles had more tone today. Daisy’s proprioception was also within normal limits at this appointment. 30 mm long, 0.16 mm diameter SERINs were used at GV 20, GV 14, GV 4, Bai Hui and trigger points along the bladder line between T8 and L3. New points were added today due to Daisy being more amenable to treatment. GB 21 was placed for regional muscle tension. BL 54, BL 40, and GB 30 were placed for neuromodulation of the sciatic nerve. ST 34 was placed for neuromodulation of the femoral nerve and for stifle instability. Bafeng points were placed for distal neuromodulation at the level of the digital nerves. Laser therapy was performed over Daisy’s cervical and thoracolumbar spine. Passive range of motion (bicycle) exercises were recommended for Daisy’s pelvic limbs to help strengthen muscles and encourage movement memory. 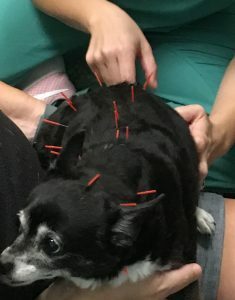 At Daisy’s third acupuncture appointment, her owners noted that she had been following them around the house a little more than before, but would still become fatigued and sit down. Daisy’s owners felt at this point that her pain was well controlled. 30 mm long, 0.16 mm diameter SERINs were used at GV 14, Bai Hui, BL 13, BL 14, BL 15, BL 18, BL 19, BL 20, BL 21 bilaterally. 15 mm long, 0.20 mm diameter Hwato needles were used in all Bafeng points. Laser therapy was performed on Daisy’s cervical and thoracic spine today. Daisy was able to walk all the way from the treatment area to her car today (~50 yards). 5 minute walks were recommended daily for Daisy, as well as core strengthening on an exercise ball. At this point in Daisy’s treatment, the owners were very pleased with her recovery. Daisy continues to get up on her own and follow her owners around the house from room to room. She has since weaned off of Gabapentin and continues to be bright and mobile. Daisy’s increased muscle tone and normal proprioception on physical exam helps support the fact that acupuncture has helped her. ICHON, Laser therapy, and weight loss certainly had a helping hand in Daisy’s recovery, but these treatments were started prior to acupuncture. It was not until the addition of acupuncture that Daisy began to make progress with walking again. Daisy’s case is a brilliant example of how medication and surgery are not always the answer. It was very helpful to have a full work up for this case, as the initial radiology report was very concerning. Even with a dedicated team of clinicians, residents, and students at the university, Daisy was not offered any solutions for her clinical signs besides pain medication. The multimodal approach of weight loss, ICHON, laser therapy, and acupuncture in addition to pain medication gave Daisy a much better quality of life than what she was experiencing prior to treatment. I strongly believe that a multimodal approach should be offered to all patients experiencing pain or similar clinical signs.